mine angel to testify unto you these things in the churches. And the Spirit and the bride say, Come. And let him that heareth say, Come. Jakob Lorber was born on 22 July 1800, in a small place called Kanischa, near the lower Styrian country town Marburg, today´s Maribor in Slovenia. He attended teacher's college and primary school course, after which he didn 't immediately receive an appropriate position. This prompted him to intensively continue his musical studies, which consisted of composing, teaching the violin, providing singing and violin lessons, composing and occasionally giving a concert. 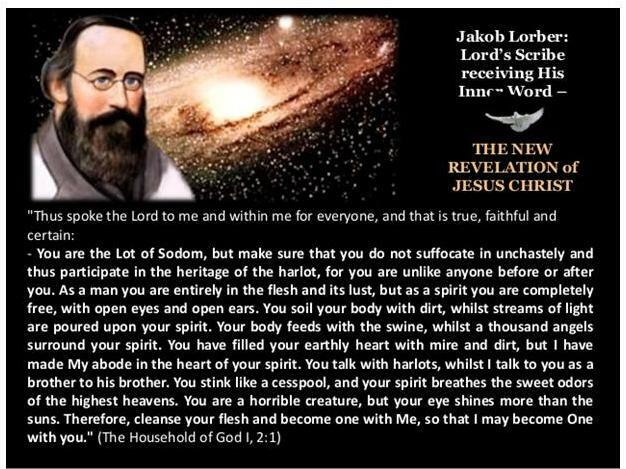 During these years, Jakob Lorber followed with great enthusiasm his spiritual inclination, diligently studying the Bible as well as the works of men who followed the "inward path", among others such mystics as Justinus Kerner, Jung-Stilling, Swedenborg, Jakob Böhme, and Johann Tennhardt. Unexpectedly, at the beginning of 1840,the theatre in Triest offered him a position as second orchestra conductor. But on the morning of 15 March 1840, he experienced something, which gave his life a different direction. He clearly heard a Voice in his heart which ordered him to: "Get up, take your pen and write!" "And thus the good Lord speaks for everyone; and that is true, faithful, and certain. Whosoever wishes to speak to Me, should come to Me and I will place the answer into his heart. But only the Pure, whose hearts are full of humility, will hear the sound of My Voice. And whosoever prefers Me to every thing and the world, and loves Me like a bride loves her groom, with such a human being I will walk arm in arm. Such a person will for all times look upon Me as one Brother would look upon another, as I have looked upon him from eternity before he existed." Afterwards, when he had written down what he had heard, it became clear to him that an unusual mission from the spiritual world had been assigned to him, the fulfillment of which was incompatible with his duties in the theatre in Triest. The Inner Voice spoke freely with authority as the voice of JESUS CHRIST . Lorber, therefore, declined the favorable offer, upon which he had placed great hopes. From that day, he dedicated his life to writing down all the information he received. Leaving his profession as violinist and conductor, he lived in poverty, earning his living only from piano lessons. Karl Gottfried von Leitner claimed that "Lorber wrote almost daily, beginning in the morning before breakfast. Completely withdrawn, he wrote at an average speed without pausing to think or correcting what he had written, uninterruptedly like someone who was taking a dictation. He often mentioned that while listening to the uttering voice he also saw visions of what he heard. It was even easier for him to record what he heard within when he could dictate it to another person. Actually, he dictated entire works to some of his friends, sitting next to the writer, quietly gazing ahead, never faltering in the flow of words or changing the structure of a sentence, or even a single expression." Lorber was also observed while writing by other notable men in the city of Graz, such as Dr. Justinus Kerner, Dr. Ch. F. Zimpel, the mayor of Graz, Anton Hüttenbrenner, his brother the composer Anselm Hüttenbrenner, Dr. Anton Kammerhuber, Leopold Cantily, pharmacist of Graz. Lorber wrote for many hours almost daily, rarely interrupted his work, without consulting any books of reference, and without any manifold knowledge, obediently recording what the voice in his heart dictated to him. As his manuscripts prove it, he didn´t correct even a single line. In a letter to a friend, Lorber confesses: "Dearly beloved friend and brother! Concerning the Inner Word and how this is heard I can only say that I always hear the Lord´s most holy Word in the region of the heart lke a clear thought, light and pure, like spoken words. No one, though he may be quite close to me, can hear anything at all of a voice. But to me this voice of grace sounds clearer than even the loudest material sound." At the later publication, after his death, there were 10,000 pages, which were comprised in 25 volumes, a unique, immense work, not to mention many shorter writings. The Great Gospel of John (comprising 11 books in the original German variant, last one written after Lorber´s death, through inner word, by a friend, Leopold Engel )* is about 2,000 pages very detailed first-person narrative of Jesus Christ's last three years of His Life on Earth, fully confirming the Christian values and the Gospels of John and Matthew. Herein there are details of His travels throughout the holy land, of the miracles, healings and, most important, teachings He performed, majority of which were never before revealed to humanity. Lorber's first complete work, The Household of God, is a spiritual account of the Old Testament up to the times of Noah. He also wrote many works regarding life in the beyond, life on other planets and stars, the structure of our Earth, Moon and solar system as well as the new medicine of the future - Heliotherapy (see the list of Lorber´s works). Considering their enormous complexity and their consistency with the Old and New Testament, but also with actual technological and scientific facts (see Examples of predictions and prophecies and Kurt Eggelstein's The Prophet Jakob Lorber predicts coming catastrophes and the true Christianity) the Great Gospel of John, but also the other writings of Jakob Lorber give an unbeatable testimony for their divine origin. More, Lorber himself claimed to be unable to understand many of the things he was told by the inner voice. The teachings deal with all the basic themes of human and universal existence: the nature of God and His identity with Jesus Christ, the Fall of Lucifer, the creation of universe and man, the purpose of human and universal existence, the principles for a healthy life of the soul and of the body, etc - see About the New Revelation. "In all ages there have been pure God-endowed men who have heard the Voice of God in their heart. We all know the many passages in the Old Testament in which the Prophet says; “And the Word of the Lord came unto me”. Also the New Testament offers much that owes its origin to an Inner Revelation e.g. The Revelation of John. In Post-Apostolic times Church-Fathers such as Jerome and Augustine, and later the Mystics of the Middle Ages e.g. Bernard of Clairvaux, Tauler, Suso and Thomas-à-Kempis etc: attached great importance to the Inner Revelation. Also Jacob Boehme (1600) and Emanuel Swedenborg (1700) wrote inspired by visions and intuitions - yet one cannot call Boehme and Swedenborg prophets in the Old Testament sense, because neither of them had the Inner Word. True hearers of the Inner Word on the other hand were e.g. the Strassburg merchant, Rulmann Merwein who in 1350 wrote the “Neun Felsen” (Nine Rocks); the N.German Superintendent, J.W. Petersen (about 1700) writer of “Tausend Eröffnungen des Geistes” (A thousand opening of the Spirit) and Joh. Tennhardt in Nürnberg who in 1712 published an “Unterweisung vom Innern Worte Gottes” (Instruction from the Inner Word of God). 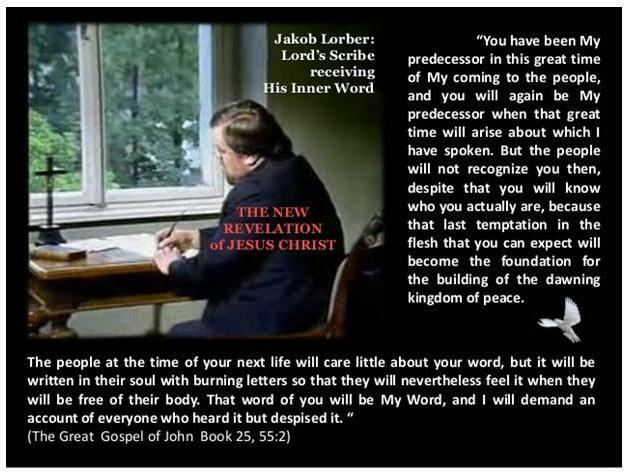 But much more significant than the last-mentioned three illuminated men of God, were the immense Revelations which were given to us men of modern times through the Styrian seer and prophet Jakob Lorber. Through this simple man of God, pure in soul, God gave to humanity in the years 1840-1864, an all-embracing, ratifying and explanatory New Revelation of the Divine Will, enlarging the Holy Scriptures, and giving His eternal plan of the universe, His purposes for men and the Doctrine of His all-powerful Love. Jacob Lorber was born on July 22 1800, in the Parish of Kanisha near Marburg in Styria (Austria), where his father conducted a musical society, also gained his living at times in other places, and possessed and worked two vineyards. The mother of Jacob was a very intelligent woman and was greatly attached to her first-born. Jacob was already nine years old when he entered the parish school of Jahring, where the village school-master also gave him instruction in music, especially in piano, violin and organ. In the year 1817, Jacob attended the seminary at Marburg on the Dreve, and at the instigation of a chaplain who had remarked the capabilities of Lorber, he began his studies in 1818 at the Grammar School. In Marburg, after he had passed through five classes successfully, he went to Graz in 1824 to continue his studies. But owing to the difficulty of earning his daily bread in a large town in which he was a stranger, he soon gave up his studies entirely and accepted for five years a position as house-tutor. In 1829, in order to secure a life-position, Lorber nevertheless took up once more the study of teaching and received a good certificate in the Higher course for Teachers in the High Schools. But when his efforts to get a teaching position in 1830 did not lead to his goal at once, Lorber gave up this life-plan, and that finally. He now devoted himself to music entirely, and in a short time had come so far that he earned a modest income as teacher of music. His special instrument was the violin which he played with much ability, and through his successful imitation of the world-renowned Paganini, he won for himself the recognition of the public. But serious as was Lorber’s efforts in art, he also felt himself drawn to other directions. A powerful yearning after a deeper penetration into the secrets of Creation, impelled him among other things to examine the starry sky at least with a telescope, although the scientific study of Astronomy lacked, in his case, the fundamental knowledge of mathematics. Above all else a certain inwardness began to manifest itself in his nature. He delighted in reading the works of authors who, in their writings, treated of transcendental matters, e.g. the works of Swedenborg, Jung-Stilling, Jacob Boehme, Justinus Kerner. However in the reading of these he made no special study, because such was in no way his affair; even these works were put aside again, and it was the Bible which he kept always at hand. Gradually he began to have significant dreams, some of which he even considered worthy of being written down. Thus Lorber had already reached his Fortieth year without having really attained a firm position. Now at last such was offered to him. Unexpectedly he received a proposal from Triest to undertake the position of second conductor at a theater there. He accepted it and prepared himself for the journey; but his life suddenly took a completely different direction. On March 15 1840, at 6 o’clock in the morning - as he related later - when, after his morning devotions he was just about to rise, he heard inwardly in the region of the heart, a voice which called him: “Rise, take thy pencil and write!” He did not delay in the carrying out of this mysterious order, dressed quickly, and seized his pen. And beginning from this hour, and having declined the post at Triest which had been offered him, he served the Inner Voice which he named “The Living Word”, for more than twenty-four years. Until his death, in humility and poverty, with self-sacrificing readiness and loyalty, he continued to act thus as the zealous scribe of the Lord. His closest friends, to whom he confided this extraordinary event, were astounded at it —indeed just at first they were seriously concerned as to the mental condition of the man whom they so highly esteemed. However, through the wisdom of what was written down by Lorber, they soon learned better, and one or another of those initiated was often present as a witness of his mysterious writing. Lorber sat quietly at his little table, having neither book nor any other means of help at his side, and, completely absorbed and comparatively quickly, but without pausing for reflection or the correction of what he had written down, he mechanically used his pen just like someone to whom another person was dictating. At the same time, what he wrote down appeared to be of no great interest to him at the moment, but when he had laid aside his pen and read aloud what was written to the trusted ones present, he often broke forth into tears of deep emotion, praising aloud the Love of God. Still more easily he dictated what he received inwardly. In that case he sat next to the person writing, looking calmly in front of him, never hesitating in the regular flow of speech, or making any additions to sentences or altering single expressions, and if by chance his dictation was interrupted for a shorter or longer time, he was able, without re-reading what was already written down, beginning from the last word, to continue as it were mechanically in the right connection. Generally he began his daily mission of writing first thing in the morning before breakfast (which in zeal he often left untouched), and then went afterwards to earn his modest income as a music-teacher. Only twice did he interrupt this regular silent occupation, in 1845 and 1846, when he stayed with his two brothers who were then living in Oberkärnten; also in 1857, when he was making a tour as a violinist through the crown-lands of Austria; but he unfailingly returned to Graz to his customary work. Lorber however felt that through this disturbing secondary occupation, he was too much drawn away from what he looked upon as his specific life-vocation. Therefore he gave it up completely and satisfied himself with earning his living through teaching music and the tuning of pianos. Nevertheless in spite of his modest needs, this income was later insufficient, for Lorber had become already too frail in health for distant walks often connected with his profession. He was then helped by free-will gifts from kind friends, the more so, as he never received any payments for his many writings. During his life-time and without his name being mentioned, these attained publication through the large monetary offerings of his friends. Of the vast works of Jacob Lorber, the most important are the ten volumes: Great Gospel of John, The housekeeping of God, The Childhood of Jesus, The Spiritual Sun, The natural Sun, Earth and Moon, Robert Blum and Bishop Martin. In the hope that we have, with the help of the Heavenly Father, presented this Edition to the satisfaction of all readers, we wish that this work, small but very impressive, may succeed in bringing very many people to the Loving Father-Heart of God." Nevertheless, mankind becomes in the course of a few hundred years more ingenious and, finally, comes up with things the previous generations would never gave dreamt of. Reaching, thus, after about twelve to fifteen centuries a kind of culmination point, it would in itself become indolent and stagnant, which is allowed on this earth by God, so that there may always be found on it every imaginable phase of human development. This is to show the more enlightened people that mankind without from time to time forthcoming revelations, remains for thousands of years in the same spot, not progressing by a hair’s breadth, as you can all see by the example of the present-day inhabitants of India and Indo-China. The Lord allows this in order to show the people who at some time visit there that things are precisely as I have now told you. But you yourselves that is, your descendants, will finally have to drag those people along, for the Lord never awakens a great prophet expressly for peoples who are on a lower level of spiritual development; but He has them, the undeveloped peoples, as it were dragged along – for which the Lord has His endlessly wise reasons – by the main nations of this earth who have actually been taught only through revelations.
" Only the one, who teaches his fellowman in the right order, as I have shown you, will build a house on a rocky surface. When storms and floods will come over such house, they will not be able to damage the house, because it was built on a rocky surface. And that Rock am I. And when you begin with Me, you will be able to do everything very well. However, without Me nothing. Remember this well, My friend. If someone seriously wants to teach his fellowman about Me, he should not seek advice within himself for too long as to how he should deal with it in the most fruitful way. For I Myself will lay the right words in his heart and in his mouth. And now that you also know that, you will not make a wrong step when you will instruct your fellowmen in My name. But he who will not completely heed this, will quickly and easily come on wrong paths, on which he and his disciple will hardly be able to find their way. That was always the evil beginning of the false and deceitful prophets and the darkening of the people and their deterioration. That is why, only he should teach his fellowmen who first was taught by Me in his heart. However, he who will teach his fellowmen out of himself and only of what he heard piece by piece from other people, as if he was taught by Me, and who will also call out: ‘Look, here’, ‘there’ or ‘over there is Christ, the Anointed Truth from God since eternity’, you should not believe, for that is a false prophet who only wants to act as a prophet for the sake of his reputation and temporarily gain. And he who wants to distinguish with little effort a false prophet from a true prophet and teacher who was called by Me, should look at his works. What man can hide least of all from the eyes of his fellowmen are his selfishness and pursuit of profit. To satisfy that, he all too soon and visibly will leave nothing untried to reach the goal for which his heart has an indestructible love.